Support art that reminds us WE’RE ALL IN THIS TOGETHER! We’re insanely committed to doing the hard work of creating original art: searching our hearts, wracking our brains, and pouring out our souls to write and tell new stories. Stories that remind us that even in the darkness, a little light makes all the difference. Stories that help us laugh together, tap our toes together, cry good-hard-tears together. Stories that remind us of each others‘ worth and humanity. Stories that help us see that– like it or not– we’re all in this together. This season we will work with over thirty Twin Cities’ artists to tell those kinds of stories. And we will work with fifty students to help them find their creative voices to tell their own stories. And we begin work on a new story– writing and developing a brand new musical to premiere next fall. And we need your help to do it. Your tax deductible gift will help us reach our year-end goal of $20,000 to write/develop/produce a new musical (to premiere next fall), honor the professional artists we work with by paying them well, and raise up the next generation of storytellers (by offering scholarships and providing resources for our Summer Theater Camps). 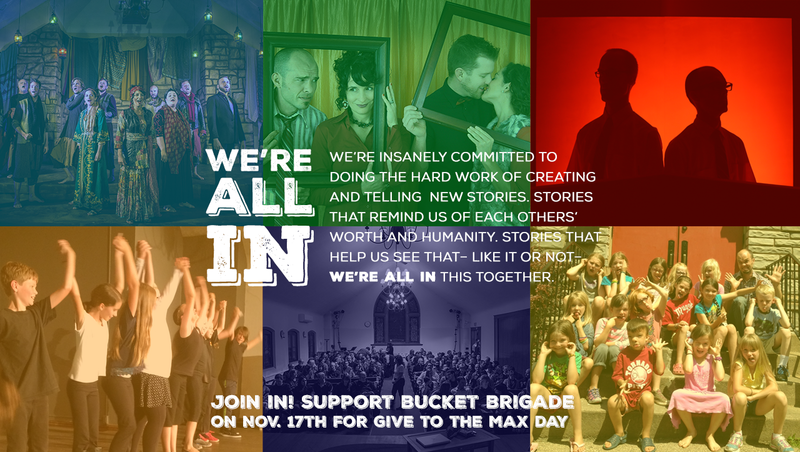 Become a part of the brigade and support art that reminds us– we’re all in this together.